Sheryl started working the front office for Dr. Craid in 1987. She enjoys the relationships she has made with many clients and their furry family members. Sheryl's positive up beat persona gives strength and stability to our team here at Stirling Veterinary Services. When we hear laughter echoing through our halls, we know Sheryl is adding her personal touch to another one of our clients. 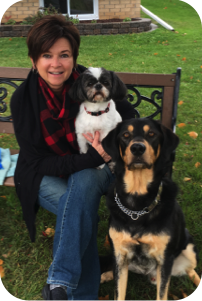 On the home front, Sheryl enjoys time with family including her husband, their children and 2 unique dogs, Tino and Oakley.